Anne Race sensed something was wrong. 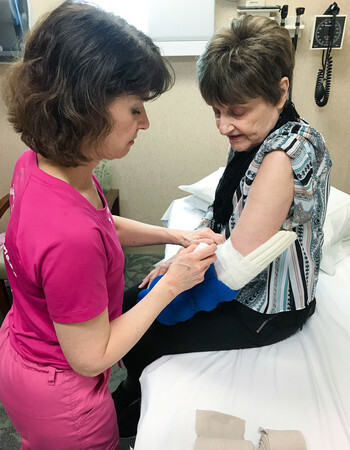 She wondered if the swelling in her left arm could be a side effect of her left breast mastectomy, a surgery that included the removal of 11 lymph nodes in her chest. Race ran her symptoms by members of her cancer survivor group. Then the Omaha native, who lived in New York City at the time, went to the library to do some research. “I diagnosed myself with lymphedema,” she said. It’s little-known outside of the cancer world, but Race had a textbook case. Lymphedema is chronic and incurable swelling caused by lymph fluid that builds up throughout the tissues. People who’ve undergone cancer treatment or had damage to their lymph nodes are at risk. An estimated two out of every five breast cancer patients will develop the condition within five years of treatment. But people without cancer can experience it, too. Race was diagnosed with breast cancer in 1995 at age 50. The diagnosis wasn’t a shock given her family history of cancer. Her mother lived with breast cancer until her death at age 62. Race underwent surgery and months of chemotherapy. Later, a scan found a tumor in her upper chest. She underwent chemotherapy again, plus radiation. She’s been cancer-free since that recurrence. Still, Race’s lymphedema is a constant reminder of her cancer journey. At its worst, her left arm was three times the size of her right. The condition dramatically affects her daily life. Tasks like lifting her arm to her head are impossible. When Race returned to Omaha in 2007, she began seeing providers at Methodist Health System. 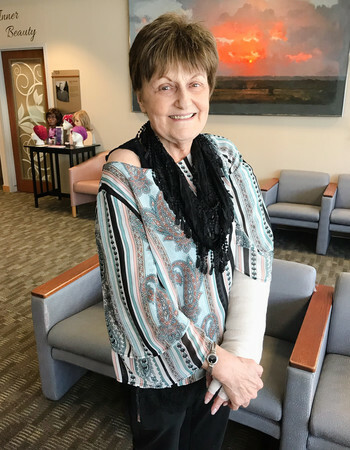 Her therapy sessions with Wendy Buchholz, OTR/L, CLT-LANA, an occupational therapist and certified lymphedema therapist at Methodist Estabrook Cancer Center, are critical. “The minute you don’t maintain, you’re back to square one in six months,” Race said. The treatment looks like light massage. Buchholz strategically applies pressure across Race’s arms and chest, working to detour lymph drainage away from damaged lymph nodes and toward healthy ones. Lymphedema prevents the body from recirculating lymph drainage. As a result, fluid collects in an arm, leg or other area. Redirecting that fluid through therapy helps the fluid recirculate, thus reducing swelling. 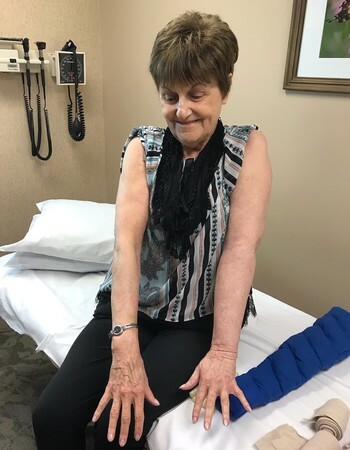 For Race, the therapy noticeably reduces the size of her arm and softens the tissues that can harden when lymphedema is left untreated. Compression through bandaging. Race wears special garments during the day and night that help manage the swelling. After a recent therapy session, Buchholz snugly wrapped Race’s arm in multiple layers. Skin care. People with lymphedema are at high risk for infection. They can’t get their blood pressure taken or shots inserted into areas with lymphedema. Remedial exercise. Movement and physical activity are important factors in managing lymphedema. Race’s activity includes therapy for an unrelated medical issue at Methodist’s Aquatic Therapy Pool. The effects of cancer treatment can linger, as is the case with a “not curable, but treatable” condition like lymphedema, Buchholz said. “There’s simply a new normal,” she said. Buchholz has been certified and treating lymphedema since 2001. Her goal is to help patients manage their condition so they can live independently. Race said Buchholz has provided her that – and more. Therapy has helped Race, 73, live her life to the fullest. She drives and likes to travel. And with her warm smile and upbeat personality, you’d never guess that she lives with a challenging condition. Race and Buchholz spend a couple hours together each week. They talk about a lot during therapy sessions. In addition to relief from therapy, Race values Buchholz’s perspective about everything related to cancer. “She’s given me knowledge,” Race said.